Boro held on at the Riverside against a late Rochdale charge to win 2-1 and so seal a place in the 3rd round of the League Cup. Playing a mix of youth and those pressing for starts against Leeds, Boro blasted their way into a comfortable lead through Marvin Johnson and Hugill goals. Then following substitutions an inexperienced Boro backline conceded but held on as Rochdale turned the screw for an equaliser. A thoroughly entertaining night for the 10 000, at the home of the Boro. 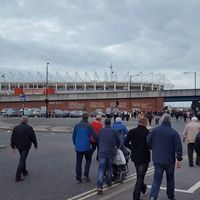 These League Cup nights have made for fascinating viewing for the devoted fans making their way down to the Riverside. Last night there was a chance to see Middlesbrough lad Jordan Hugill make his first start since joining us on loan. Mo Besic was also making his first start since rejoining on loan. At the other end of the spectrum, 16 year old centre back, Nathan Wood, became the youngest ever Boro player to start in the League Cup. Why would you not want to see such history unfold for the Boro? Playing alongside Nathan Wood was the steadying influence of Saturday's goalscorer, Daniel Ayala, at least until he was removed midway through the second period. They also do not come much more experienced than the man with the gloves, Andy Lonergan, who made a string of superb saves and anchored the defence as it faced a late siege from the visitors. There was plenty of tidy, free-flowing football in the first half. A really impressive Paddy McNair was powering into space down the right and came very close to opening the scoring. The ever lively Ashley Fletcher latched on to a pass from the equally impressive Mahmutovic and some thought he had scored as his effort was diverted into the side netting. Marvin Johnson picked up from where he left off in the last round against Notts County and curled over an enticing centre. It wasn't all Boro though. Skipper Grant Leadbitter almost gift wrapped a chance when he passed blind to a Rochdale forward in front of goal. Lonergan had to be alert in goal to thwart several efforts from the game visitors. It would be Marvin Johnson that would open the scoring. The winger was alert when Hugill's header rebounded off the inside of the post. He calmy and clinically slotted home the rebound. At half time Boro withdrew Besic and Ayala, no doubt with Leeds on Friday in mind. The replacements would both play down the right in Djed Spence and David Luiz hairbear alike, Bilal Brahimi. They are both impressively fleet of footed and as free flowing as their hair. Boro seemed to have the tie in the bag when Jordan Hugill rose to head home a Johnson cross and past the Dale keeper for 2-0. Hugill had played so well for an hour, he has to be pressing for a start at Elland Road. Boro could then take off Hugill and bring on Harry Chapman, now recovered from the shoulder injury he suffered in the last round. It was another opportunity for Chapman to show what he could offer if elevated to the first team squad. He was unlucky to see a great bit of skill thwarted by the frame of the goal. That would have been a tie-clinching goal but Boro had a cushion and looked comfortable anyway. But only a month ago we had been 2-0 up and in control against Rochdale in a pre-season friendly. Look how that turned out. When Rochdale struck to get a goal back there were memories of Spotland and last ditch defeat. Amazingly most of the same players were now out on the pitch for Boro. In front of Lonergan the Boro defence must surely be the least experienced I have ever seen contest a competitive game for Boro. Alongside 16 year old Wood was Enes Mahmutovic. At left back, winger, Marvin Johnson and at right back attacking flanker, Djed Spence. It was now all hands to the pumps as Rochdale poured everyone forward. Ashley Fletcher came back. Tav and Leadbitter withdrew and Lonergan showed the safest pair of hands and exuded calm. Even so when the 4th official showed 5 minutes left, there was a sharp intake of breath around the home fans, 5 minutes seemed like an eternity. But Boro dug in, Leadbitter flung himself at the ball, the youngsters contested everything and blocked everything. Lonergan was commanding. The players wearing the Boro red shirts were absolutely determined that Rochdale should not steal the show at the death. Mind you there was a heart stopping moment when an acrobatic Dale bicycle kick flew just off target with almost the last kick. The final whistle blew. Relief and another top, top cup night that was applauded by the hardy 10 000. There were some really outstanding performances to savour and all knitted together into a top team effort. Of those that played the full game, McNair and Fletcher have surely done themselves no harm as far as first team is concerned. McNair was particularly outstanding with his powerful running. Could a confident-again Marvin Johnson have given Tony Pulis an option for the left wing slot he wants to fill. His crossing and shooting were a feature of both cup games. Then there are the outstanding youngsters. What a night for Nathan Wood, a tremendous performance he gave against big burly League One forwards. Djed Spence and flying Frenchman, Bilal Brahimi, were full of flicks, tricks and speed and not just from their hair styles. Could Enes Mahmutovic one day be our first Luxembourg defender. I really like him, every time I see him play.